ROLLING MEADOWS – With the pomp and circumstance coming from the Winter Olympics, it’s easy to forget the 2018 Paralympics compete just two weeks after. Athletes have trained and prepared to compete in five sports, and begin their Games on March 9. Illinois’ three sled hockey players, Josh Misiewicz, Brody Roybal and Kevin McKee, were preparing in a different kind of way recently. USA Hockey hosted two benefit games last weekend at the West Meadows Ice Arena, with the team splitting in half for a friendly scrimmage. All proceeds would help the 2018 U.S. Paralympic Sled Hockey team families’ travel costs to South Korea. The response was overwhelming, as according to USA Hockey spokesman Jon Gomez, more than 500 tickets were sold each night at $5 apiece. However, on Saturday attendees filled the 1,000-seat venue. Roybal scored the white team’s only goal in an irrelevant 4-1 loss to the blue team, which was more of a hard-hitting warm up than a friendly scrimmage. “It was fun to just test our skills, see where we’re at and get a little warm up before the games,” Misiewicz said. Misiewicz, a La Grange native who has been apart of Team USA since 2015, is preparing to compete in his first Paralympics. He said his teammates have shown him the ropes on dieting and training ahead of the Games, but his teammates say the former Division III hockey player doesn’t need much help preparing for the Games. Misiewicz’s path to the Paralympics differs from his Chicago counterparts’, as he became a double-knee amputee after being injured by an IED while serving as a U.S. Marine in Afghanistan. For Misiewicz, the Paralympics is another way for him to represent the country he fought to defend. Roybal and McKee both lost their legs due to congenital birth defects. Roybal was born without a femur in both legs, and McKee was born with sacral agenesis, or abnormal fetal development in the lower body. The three get to share ice time, as during the second half of last Saturday’s benefit game they skated together on the same line for the white team. 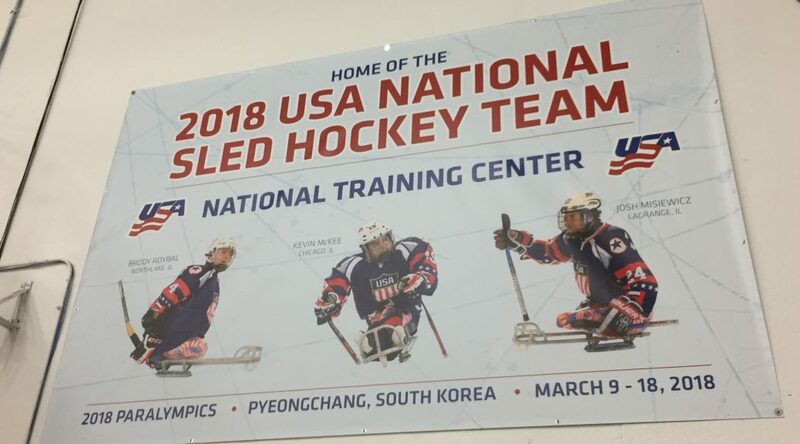 West Meadows Ice Arena even put up a Team USA Sled Hockey poster, which features the three Illinois skaters as if they’re the face of the team. Wintrust Bank also sponsors Roybal and McKee as two athletes on “Chicago’s Team” for the 2018 Winter Games. Other sponsored athletes include five-time Olympic speed skater Shani Davis and gold medal-winning hockey player Kendall Coyne. The team left for South Korea on Friday, and will spend the week preparing to try and win their third-straight gold medal. McKee, Roybal and Misiewicz agreed their main competition would most likely be Canada, which they’re expecting to face in the gold-medal game. Team USA and Canada are already know each other closely as they’ve played twice in the month of February, splitting the two-game series with a 2-1 win on February 7 and a 3-0 loss on February 10. “The city of Chicago being behind me, Wintrust being a sponsor for me, it’s awesome to have all that support here in Chicago.” – Brody Roybal. Furthermore, Team USA has a 2-3 record against Canada in 2017, which pales in comparison to the rest of the international competition. At the 2018 Para Ice Hockey International Tournament in January, Team USA played Norway, Italy twice and Japan twice, and won all of those games by a combined score of 37-0. They did not allow a goal and averaged 7.4 goals per game, making Canada the team’s main focus. As the sled hockey team came off the ice at West Meadows after their game, kids and adults alike surrounded the players. Spectators would interrupt ongoing interviews in order to ask for photos, autographs, or just offering words of encouragement. However, the players don’t want their disabilities to take the spotlight, but rather that they’re out to win gold. “We’re just like any other hockey player,” McKee said.